The New Paltz Academy in the mid-1800s. It is no mistake that New Paltz is home to a state university campus today - that institution has its roots in the New Paltz Academy and the New Paltz Normal School, both of which were founded by Huguenot and Dutch descendants in the 19th century. In keeping with the tradition of our Huguenot founders, Historic Huguenot Street supports education today through scholarships. These awards are offered to undergraduate and graduate students in collaboration with the Hasbrouck Family Association. The Charles J. Hasbrouck Memorial Scholarship, administered jointly with the Hasbrouck Family Association, is a $1,000 award that may be divided if necessary. Applicants must be working toward a degree in Historic Preservation, Art History, or Architecture at Hamilton College, Columbia University, or the State University of New York at New Paltz. Kenneth E. Hasbrouck, Sr. History Scholarship, awarded every other year beginning in 2001, awards one $1,000 scholarship to a college student (undergraduate or graduate) studying the impact of Huguenot immigrants or their descendants on American culture and/or language, or on the history of Ulster County, New York, during the period 1600 to 1800. If the recipient produces a report or dissertation growing out of his or her study, a copy shall be furnished to Historic Huguenot Street. This scholarship is available for award in 2019, and applicants are encouraged to apply this year (the scholarship will be eligible for award again in 2021). The Lucille Stoeppler Baker Scholarship is one award of $1,500, awarded each annual award cycle. Applicants must be majoring in historical anthropology and have have an academic average above 3.5 for at least two years. Dr. Baker, who provided the bequest for this scholarship fund, was a longtime professor at Tompkins Cortland Community College in Dryden, New York. The Gertrude E. Hasbrouck Memorial Scholarships are two annual awards of $2,000 each, awarded independently by the Hasbrouck Family Association. Additional scholarships may be awarded by the Hasbrouck Family Association under appropriate circumstances. Applicants must be of documented New Paltz Huguenot descent. All application materials and inquiries for this scholarship must be sent directly to the Hasbrouck Family Association (see application instructions below). 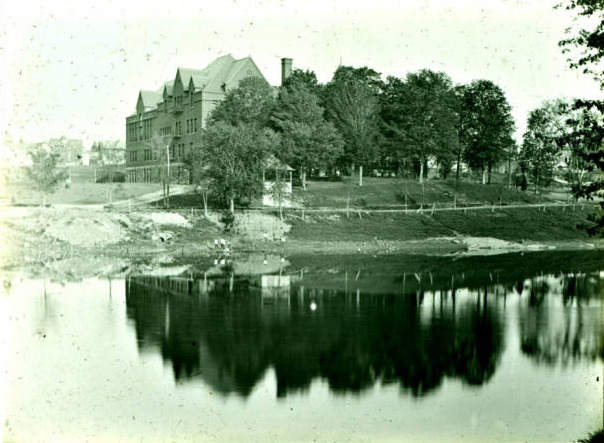 The New Paltz Normal School in the late-1800s. In order to be considered for a scholarship for the coming academic year, completed application packets must be received by August 31. All applicants must submit a completed application form, two letters of recommendation, a statement of the applicant's goals, and an official transcript. Transcripts must be official copies and must either be mailed directly to Historic Huguenot Street or be sent in a unopened, sealed, and marked envelope from the registrar. Students enrolling as undergraduate freshmen are not eligible for the aforementioned scholarships. We strongly encourage submission via email to caitlincu@huguenotstreet.org. Please include the words "Scholarship Application" in the subject line. If you have any questions for the Hasbrouck Family Association about the Gertrude E. Hasbrouck Memorial Scholarships, please contact them at info@hasbrouckfamily.org. Decisions regarding awards are made by early December. Awardees are informed in mid-December. Awards are mailed directly to the bursar at the awardee's college or university in January, at the latest. If you have any questions regarding scholarships offered by Historic Huguenot Street, please contact Caitlin Cummings, Business Manager, at caitlincu@huguenotstreet.org.